Today my brother Austen would have been 24. We're only 16 months apart. I loved having a brother so close in age. Growing up I always had a playmate and a partner in crime when it came to picking on our younger two siblings, William and Anabelle. William didn't even come around until 1992, so for years it was just the two of us. And eventually we became 4 (siblings)... and now more... and our sibling love grew. But Austen and I will always have that special bond. For those of you who don't know, my brother struggled with addiction for a long time. Thursday he lost that battle. I can't believe it's only been two days. It feels like it's been an eternity since my mom (SMom, in this post) called me to tell me. I have amazing friends from school that took me home, packed me, booked me a flight, and got me to the airport. Thank you. I couldn't have done it without you. Last week I found myself joyous at the start of spring. Trees and flowers had begun blooming. The sky was blue. Lawns had begun turning green. I was walking around truly in awe of the beauty of spring. Hubby, Sammy, and I even had a picnic in our backyard on Friday night. It was wonderful! Here are some pictures I took to document spring. 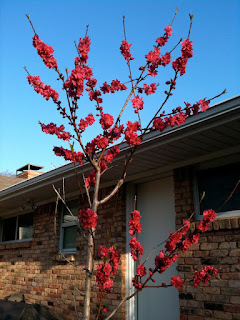 Our peach tree is blooming and budding! The last of my winter flowers. Hangin' in there! My peonies sprouting... okay so it came from a bulb. But it looks spring-y, right? Then Saturday morning we woke up to bitter cold. And Sunday we woke up to snow! Friday it was 70, and Sunday there was snow - on the ground! Happy spring! March 21, 2010! Supposedly this week we'll be back in the 70s. I hope so! Ready for part 2? If you missed part 1, go read that first. Keep in mind that I am NOT trying to convict anyone to change their ways. 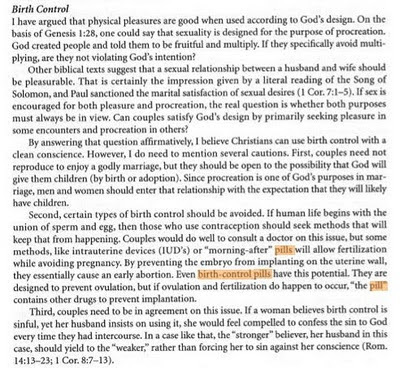 But like I said in part 1, I was honestly hurt that my friends had good solid reasons - biblical ones even - for getting off the pill and had failed to inform me. Like I said before, I'm still paying for it. My body is completely crazy. This is a sad sight isn't it? 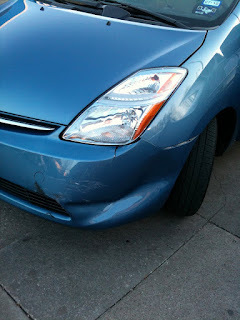 About a month ago the Prius got into a little fender bender. I was driving along the 75 access road, protected, I might add, by a solid white line to my left. (For those of you who don't know - technically you can cross a solid white line AT YOUR OWN RISK. Otherwise, don't cross.) The car to my left (on the other side of the solid white line) decided it wanted to pull into the parking lot on my right and cut across my lane, directly in front me. The driver did not switch lanes. She cut across my lane. It's taken almost a month with insurance to figure out who's at fault because that driver was saying I rear ended her... even though the pictures of her damage and cop report clearly show differently. (I hit her at her back right tire - so on her passenger side.) Finally insurance came back saying she's responsible. Duh. Yea! That means the Prius is getting fixed! Q: "Is it ok to go on a birth control pill that erases my period entirely?" Note: This is what I was on. I was on Seasonale, which makes you only have your period once every three months. Ever watched Collin's Follow Me Monday series? It's great! Collin is the author of Hip2Save. Check out her latest video here. Donate your freebies! All four years of college, I volunteered as a Young Life leader for Highland Park. I loved being able to love on kids and teach them about Jesus. Especially in a place like Highland Park. A lot of people think time ministering is better spent in the inner city. No doubt, that's important. But the kids in Highland Park have everything - a new car, new Gucci bag, the latest Tori Burch shoes. The last thing they think they need is Jesus. What could He possibly give them that they don't have? So showing them their need for Him is no easy task. There were times I just wanted to quit because they barriers those kids put up can seem impossible to penetrate. But then, I always stayed. And God gave me a few girls that loved Him and taught me a lot along the way too. Their faith encouraged me to see the potential in their classmates. As most of you know, I'm currently interning for my counseling masters program. I haven't shared much because obviously, things are confidential. I have one good terrible story though that because of the nature of it doesn't seem to fall under "counseling," so I'll share. Last night we had one of those "worst case scenarios" with a support group we were asked to facilitate - just as facilitators, not counselors. They didn't want leaders, but someone unrelated to the group pulled us in without telling them! Who does that?! So there was a clear lack of communication to us and to them from the start. My hubby helped one of his friends out with this short film, and it made it into the film festival! If you have time, watch it. I think it's so funny!